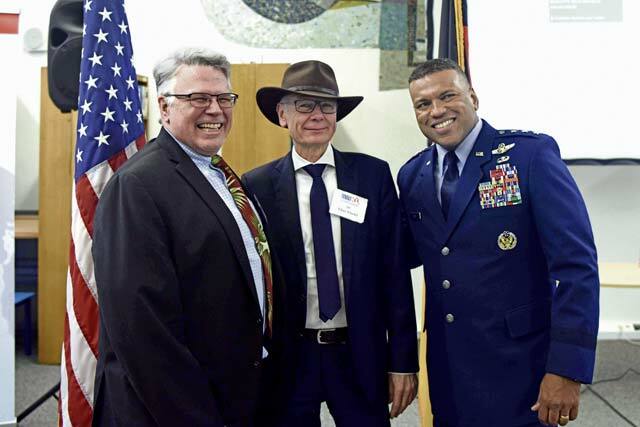 (From left to right) Consul General James Herman, U.S. Consulate General in Frankfurt; Kaiserslautern’s Lord Mayor, Dr. Klaus Weichel; and Lt. Gen. Richard Clark, 3rd Air Force and KMC commander, pose for a photo at the German-American Community Office’s 15th Anniversary ceremony Feb. 15 in Kaiserslautern. 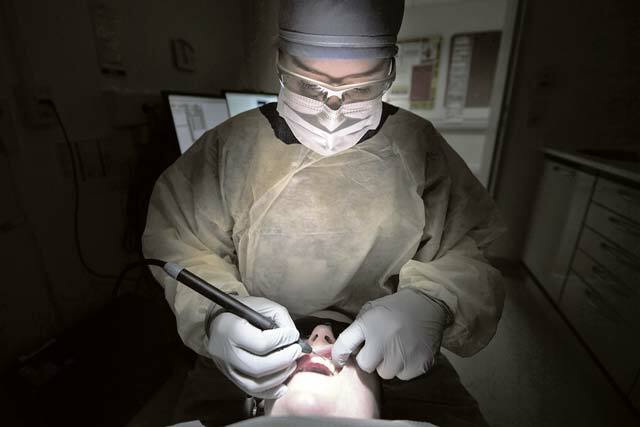 Herman, Weichel and Clark represent three different government entities that have come together to form an international partnership through GACO. GACO was established in 2003 as a way to provide services to Americans, both military and civilian, as well as Germans who have issues concerning German-American matters. “GACO was founded after 9/11 by Lord Mayor Bernhard Deubig, who said that all the world’s problems can only get solved together,” said Kaiserslautern’s Lord Mayor Dr. Klaus Weichel. A crowd of approximately 60 people came to the anniversary celebration to commemorate the achievements of GACO. GACO has assisted thousands of people in the Kaiserslautern Military Community. When families come to Germany, they may need help obtaining information about passports, driver’s licenses and schools, among other things, said Clark. This office gives them a place within the community that can steer them in the right direction and help them immerse. To make themselves known to the KMC, GACO participates in local markets and fairs. “We’re grateful for all the help GACO has provided over the years and look forward to a lasting partnership,” said Clark. GACO is located on Lauterstrasse 2 (Rathaus Nord) in Kaiserslautern, across from the city hall. Open hours are 9 a.m. to 1 p.m. Monday, Tuesday, Wednesday and Friday, and 2 to 6 p.m. Thursday. The staff can be reached by phone at 0631-363-3010, via email at info@gaco-kl.de, or through their website at www.gaco-kl.de. 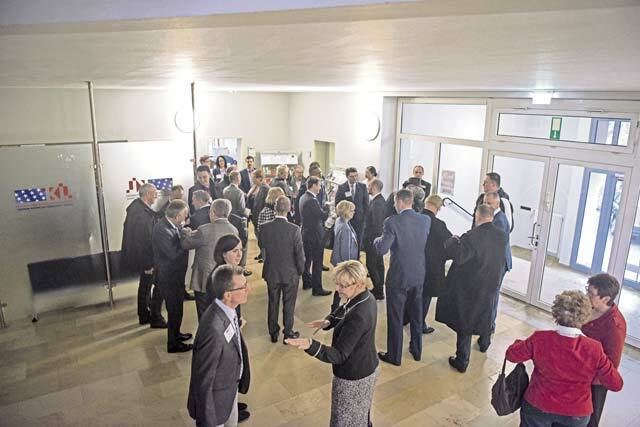 Visitors of the German-American Community Office’s 15th anniversary reception socialize while awaiting speeches from Kaiserslautern’s Lord Mayor Dr. Kaus Weichel and Lt. Gen. Richard Clark, 3rd Air Force and KMC commander, Feb. 15 in Kaiserslautern. 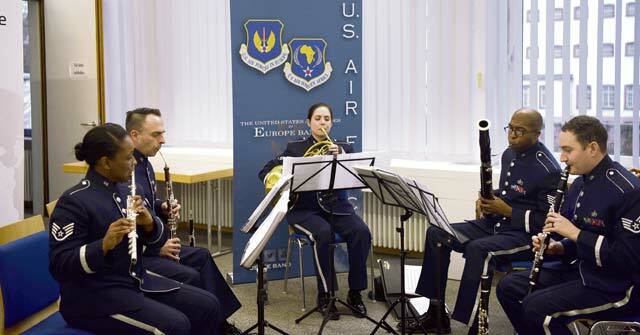 The U.S. Air Forces in Europe Winds Aloft Woodwind Quintet plays at the GACO’s 15th anniversary reception Feb. 15 in Kaiserslautern. The band played background music before and after the ceremony.